Isn't it interesting that when faced with what appears to be 'tough times' you propel yourself down a path where you are actually trying to translate questions you hold rather than answering them. Yeah, it's been a bit quiet on the blogging front lately because I've been concentrating on a few different facets of my life, and I've simply depleted my energy reserves. It's hard trying to juggle work, family, exercise, couple time, alone time, social time, being sociable, general interest/hobbies, mindful parenting, and sleep. What's more all that takes precedence over the other stuff you do in order to keep your life in order! Plus, it doesn't help that I've been slightly obsessed with Ingress (although a very pleasant distraction) since last Sunday. If you haven't heard of Ingress here's a sentence straight from wikipedia describing what it is: "The gameplay consists of establishing "portals" at places of public art, landmarks, cenotaphs, etc., and linking them to create virtual triangular fields over geographic areas." Essentially if you've ever played "capture the flag" in real life, and enjoy finding interesting art work, plagues or places of interest in the area (that you may not have known even existed) then you'd understand why the game is compelling. It makes you want to get out and about and walk around looking for these things using your GPS enabled smartphone. It's also strategic and tactical depending on how you want to play the game. You are building these virtual triangles between different locations, but at the same time there are real people out there who are doing the same thing, but on the opposite team. So you try and outsmart each other by anticipating what they will do and then block them, or try and take back the place they captured. There are hundreds of people playing this in Auckland, and multiple thousands of players around the world - and you don't even know who they are except by their online name. I know it sounds weird. I read what I've just typed and it sounds in some ways like "The Matrix" movie. Besides everything else that's going on we've also kinda sorta shifted house - maybe 80ish percent done. All that needs to happen now is to sort out what we keep and what we throw out/give away from the stuff we still have at the apartment, and then we get contractors in to finish up with the renovations. I need to motivate myself to do said tasks...which is easier said then done. But I will try hard this week (and/or next week). 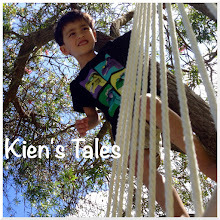 It is nice that I can send Kien outside to play without having to be out there myself. School holidays are over - the only impact with school break is that Kien's swimming lessons cease until the new term starts again, which was this last week just been. So back at swimming lessons last Tuesday. Start of Term 3 swim lessons from Lien on Vimeo. It's amazing how fast these kids learn. As you can see in the video he can get from A to B by himself now. The pool depth there is above his head, so it's pretty cool he has the confidence to swim to the platform on his own. The other day/week I took Kien to one of our favourite haunts, the Auckland War Memorial Museum. Ok, that's all I've got. I've got a tonne of things in my head I want to type, but Dreamland is beckoning, and that place is way too enticing to ignore.